Anuruddha (Sinhala: අනුරුද්ධ මහ රහතන් වහන්සේ) was one of the ten principal disciples and a cousin of Gautama Buddha. Anuruddha was the son of Sukkōdana and brother to Mahanama. 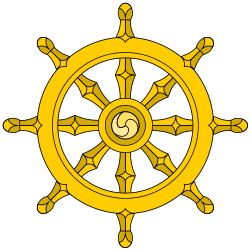 Since Amitodana was the brother of Suddhodana, king of the Sakyas in Kapilavastu, Anuruddha was cousin to Siddhartha, (Gautama Buddha). He was a kshatriya by birth, enabling him to be raised in wealth. Anuruddha returned to his home town two years after the enlightenment of Gautama Buddha, preaching his ideas to the Sakyan kingdom. Together with his 3 cousins Bhaddiya, Ananda, and Devadatta and their barber Upali, became ordained by the Buddha at the Anupiya Mango Grove. ↑ Hecker, Hellmuth (2006-06-18). "Ananda, The Guardian of the Dhamma". Buddhist Publication Society. Archived from the original on 28 March 2007. Retrieved 2007-04-05.